Deep fried crisp pooris with potato or pumpkin curry and some pickle is a meal few Indians can resist. I have often seen many westerners too enjoying this popular Indian fare on the streets in India. The dish is often served with methi ki launji, an odd-looking bitter-sweet chutney. Whenever I have had bedmi poori alu subzi and methi ki launji meals with friends, the chutney evoked extreme reactions each time. Some would discard its bitter-sweet goodness instantly, while most others would go for additional helpings. 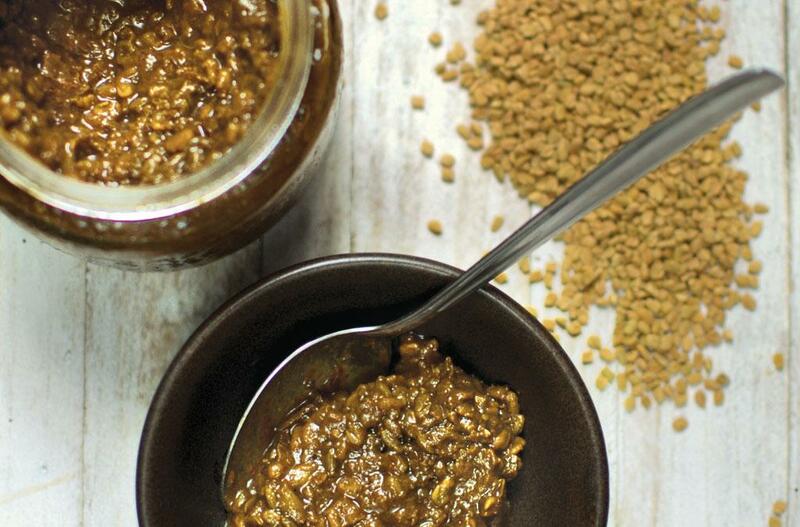 This interesting grainy and brownish chutney is made out of whole seeds of fenugreek (Trigonella foenum-graecum) or methi, some chopped dates and raisins, some spices and jaggery to offset the bitterness. This chutney is a fine example of how a dish can be balanced in flavours. In ayurveda, balancing flavours means that the food must contain six flavours that our palate recognises—sweet, sour, salty, pungent, bitter and astringent. All edible foods are divided into these six categories, according to their taste. The six tastes or flavours help balance three fundamental bodily humours or doshas, namely vata, pitta and kapha. The use of fenugreek is as much a culinary practice as it is part of an ethnomedicinal wisdom. Methi ki panjeeri or methi ka laddu are popular dishes prepared to enhance milk production, improve blood flow and the core of the uterous for new mothers. There is an extensive tradition of making such laddus and panjeeris along with other herbs to promote healing after childbirth. Fenugreek is also useful to treat bone-related illness. It not only has a potent hypotensive and anti-inflammatory element, but promotes muscle health. The culinary tradition of using bitters like fenugreek in everyday food has a deep link to ayurveda. So we can now understand why there is a tadka of methi seeds in kadhi, brinjal and pumpkin curies, and why the leaves of methi are considered so healthy. While fenugreek greens are consumed as a vegetable cooked along with other vegetables, fish or meats, the seeds are mostly used as a mild flavouring for tadka. Alu methi, a dry curry made with potatoes and fenugreek greens, is popular during winter in north India, so is Punjabi methi ka paratha or Gujarati methi na thepla. In Maharashtra, tender baby fenugreek greens are very common in markets and people toss them over curries and salads to bring freshness to the dish. Another variety of fenugreek is called kasoori methi. Its leaves are generally dehydrated and used as a dry herb. The popular tempering mix called panchphoran is another example of balancing the six flavours. This panchphoran is used in many “sweet and sour” varieties of vegetables traditionally, bringing out the sweet taste through the vegetables used. Methi is also an important ingredient in sambhar powder used in many south Indian states. A roasted lentil powder from Maharashtra called metkut also uses roasted methi seeds for balancing flavours. Some Bengali curries and chutneys use roasted methi and fennel powder as a final garnish to infuse a unique bitter-sweet aroma in dishes. In fact, many people soak methi seeds in water overnight and drink the water to stabilise blood sugar levels. Some eat the soaked methi seeds for boosting immunity. Sprouted methi seeds are even used to make medicinal hair oil in Kerala along with other herbs, and wet methi seed paste is a great poultice for treating skin inflammation and infections. As large populations are suffering from metabolic disorders caused by a sedentary life, dependence on packaged foods, excessive sugar and high fructose corn syrup in packaged foods, the use of fenugreek can revert insulin resistance and prevent fat deposition in monosodium glutamate-induced obesity. Mix the soaked methi seeds, fennel seeds, chopped raisins and dates with two cups of water and salt and pressure cook. Remove the lid and let it cool down. Now add all the other ingredients, and simmer till the chutney becomes thick, almost like a jam. You can keep the chutney thinner, but that tastes better when you use more jaggery or sugar as the syrupy chutney carries the other flavours. Add more jaggery if you feel the launji is too bitter for your taste. Modern studies validate the ayurvedic principle of balancing the flavours through fenugreek. An article in Veterinary World in 2014 talks about the ability of fenugreek to increase milk production through interactions with dopamine receptors. Drinking tea prepared with fennel and fenugreek can suppress appetite in overweight women, says a study published in July 2015 in Clinical Nutrition Research. Another study published in 2010 in Journal of the International Society of Sports Nutrition shows that a proprietary preparation made of fenugreek has a significant impact on both upper and lower-body strength and body composition. It is heartening to see finely powdered methi available in many organic food shops today. This indicates that more health conscious people are including this common yet potent bitter element in their food. I also came across a dry pack of methi ki launji that can be soaked in water and simmered briefly to make almost instant methi ki launji. If such ancient foods could be made into instant food, it could give instant noodles a run for their money. Scores of people have often asked me for the recipe of methi ki launji. I take it as a sign of the return of ancient wisdom of food being the medicine.